This rosemary white bean dip makes a tasty little snack or appetizer. A great addition to a party platter or cheese board for easy entertaining! 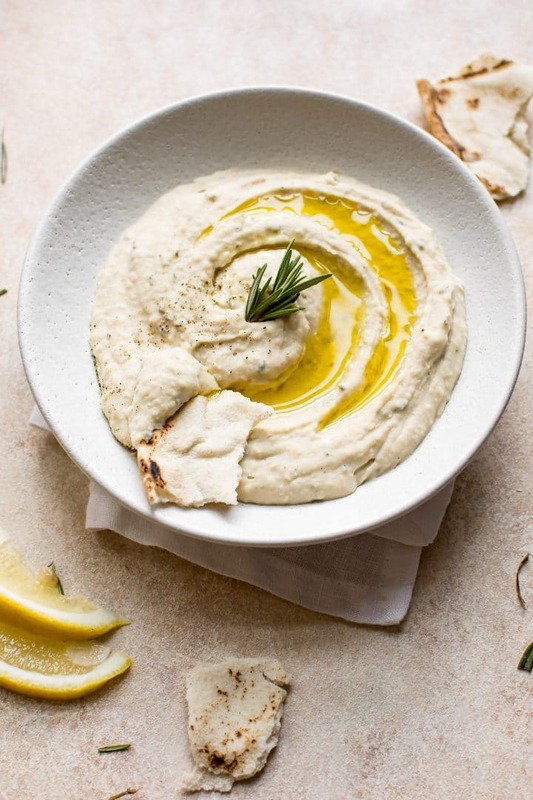 This cannellini bean dip is infused with fresh + fragrant rosemary, olive oil, a touch of lemon juice, a bit of garlic, and then drizzled with even more olive oil to finish it off. Yummy. I’m a big fan of dips. I can eat dips, pita, and olives for dinner and I’m one happy camper. I love to make everything from eggplant dips to tzatziki. I also have another white bean dip on here that I’m a big fan of – my sun-dried tomato and basil white bean dip. On that note, we had a mid-September frost (crazy, I know!) that killed my beloved basil plant. Not impressed. This dip also made me think of my whipped feta with fresh herbs recipe – another dip/spread that’s perfect for an appetizer table. Rosemary always reminds me of cooler temperatures, but this dip really works year-round in my opinion. Now that football’s back (go Broncos! ), this is something you could serve as a healthier option on game day. This vegan dip recipe is really easy to prepare. You add everything to the bowl of a food processor and process it for a few minutes. Rosemary needles can be a little tough, so I made sure to blend it for long enough that they were suitably broken down. Questions about this white bean dip recipe? Let me know! Remove the needles from the stems of the rosemary sprigs. It's ok if you don't get an exact tablespoon since it's kinda hard to measure them. Add the ingredients to the bowl of your food processor. Process on high while drizzling the oil in slowly. Stop to scrape down the sides. I processed the dip for a few minutes to ensure the rosemary needles were broken down enough. Serve immediately or chill first. I like to drizzle a bit of olive oil on top just prior to serving. This is the food processor I used to make this dip. If you use a smaller can of beans e.g. 15 fluid ounces, I suggest adding slightly less rosemary. You can always add more in if needed. I’m going to have to try this. It sounds so easy and delicious! Thanks for sharing! This Rosemary White Bean Dip looks sooooo silky smooth! And I LOVE the rosemary for fall. This looks so delicious. I love a creamy bean dip. The rosemary and garlic are a match made in heaven. Thank you!! I agree… love that combo too. This was delicious. I tried it as an alternative to a bean dip I did not like on a food plan I’m trying out. I used overcooked great northern beans from the pressure cooker and dried herbs de provence because I was lazy looking through my spice drawer for rosemary. Anyway. This was really good. I recommend a hearty pinch of salt. I just tried making this in my vita mixer which I use for everything since I dont have a food processor. Otherwise I followed your recipe. It came out like paste… idk why. ?? Any ideas.? Hi! Vitamix blenders are VERY powerful, so I can see how it would come out as a bit of a paste. It’s hard to describe the texture I achieved… sorta like a firm hummus maybe? It’s not really meant to be light and fluffy. You could try adding a bit of water to thin it out maybe?